Click on this link for the Memorial page to see the pictures of various memorial services and to sign the guest book go here. Equestrians will see Sir Jerald's belt of knighthood and see the story of how it was passed on to the next knight 10 years after his death. 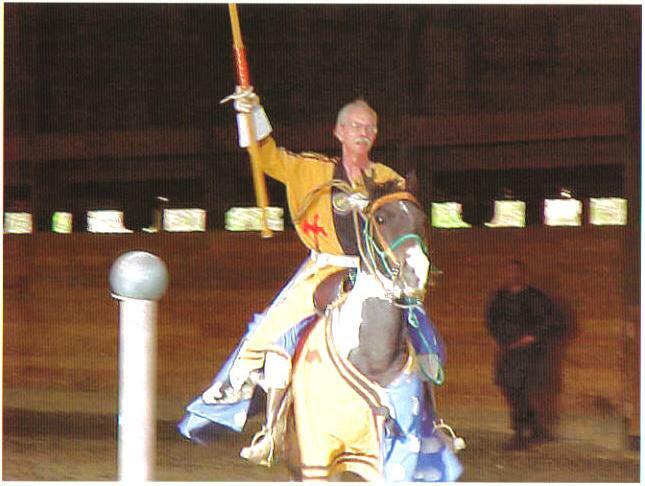 A Riderless Horse Ceremony and Memorial Tournament was held in Honor of Sir Jerald. The Equestrian Championship at Summer Hunt on Saturday is now called the Sir Jerald Memorial Equestrian Championship. To hold the field of heaven. As Jerald rides forth once again. As the lance is regained, and the sword girded once again. Let the banner be raised in the angel’d winds. And Jerald rides forth once again. nor swung a truer sword now or before. who rides in peace forever on the moor. He will be sorely missed. A true horseman, and one of the few I've ever met with whom you could "agree to disagree". The Known World will be a touch poorer for his loss. Sir Jerald stories for years to come, over many a cup. This has been quite a year for loss. He will be missed. calms a bedded herd tonight. and a melody he hums. though a hundred angels try. if it wasn't for a song. fallen from the AnTiran sky. Lion Herald designed AnTir's Arms. to be with us in spirit if not in form. I regret that many of our newer Trimarian Equestrians will never have the chance to meet Sir Jerald, it is a huge loss to all of us. A great equestrian, a noble competitor and my most beloved knight. I'm sure that Jerald's Morgan stallion met him at the Rainbow Bridge and that Cisco came along to beg for carrots as well. They run the Summerlands now, but those of us left behind will still grieve. THL Myra and I will always wear his belt with pride and remembrance of a noble man and unfailing champion. shapers of the legacy of the SCA. It's very hard to read about this. few weeks and forwarding our emails for him to read. Donwenna said he really enjoyed them. times but the man was smart and had a good heart. 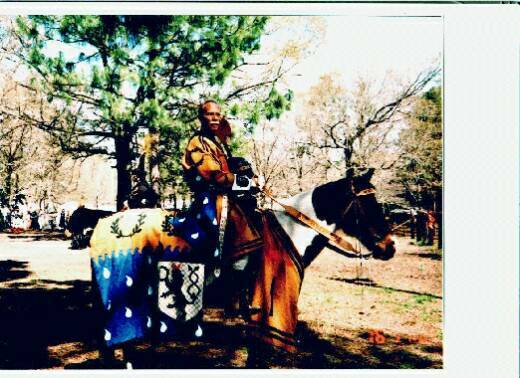 I was lucky to have been able to work with him with my horse on the medieval games. He'd spend time patiently writing me emails when I didn't understand something from the An Tir Horse list. He helped me out with swordfighting. I look forward to hearing others share their stories. Long ago, a Noble Lord had been separated form his fellows while hunting boar. Without warning a bear emerged form the brush. The frightened horse reared up, this frightened the bear, so he attacked the horse. As the horse went down, the Lord stabbed the bear with his spear. Reeling in pain, the bear ran away. Knowing the danger of a wounded animal, the Lord followed him. He knew his fellow Lords would hear the attack and join him. He had not gotten very far, when he heard the bear again, but this time it was followed by human screams. He rushed in to see the bear mauling a peasant. With a few good strokes of his broad sword, he dispatched the bear. His fellows soon found him, dressing the wounds of the peasant. They chided him for caring for a man squatting on his land, most of them had been known to put a man to death for living off their land. But, he had a gentle heart and he felt responsible for the man’s wounds. He sent for his surgeon and had the man taken to his keep. The man was a simple peasant; he had no home or family. When he saw the bear attacking, he greeted death as the end of a miserable life. They took him to the keep and prepared a room for him. Once he thought he was in heaven. For even the Lady would help care for him. When he awoke to see her, he thought her an angel. When his strength started to return, the Lord went to see him. “I am sorry about the bear. But your wounds are healing and soon you will be free to leave.” The man laughed. The Lord, thinking the man was making light of his hospitality, became upset. “If you think I am soft headed as well as softhearted, you are wrong. You will take with you what you brought in and that is all,” he said. With a great deal of effort and pain, the man was on his feet. “You say I am free. But, because of you I will never be. My people would say I owe a debt that can never be repaid. You can send me away, but I will never be far. I will watch for your enemies, and guard your family when they leave your keep. I am a dirty, unmannered peasant, but this peasant owes you his life, and some debts are never paid.” The Lord did not know what to say, so he helped the man back into bed and left. He decided to keep the man close, where he could be watched. When the man was fully healed, he was given duties and responsibilities, but this was not enough, he asked to also be trained as a warrior. The Lords family prospered. The man kept the room he lay dying in so long ago, as his own. To the children, he was an uncle, and he loved them as his own. When the only son was fourteen, they were on a boar hunt. The youngster fell from his horse, in the boar’ path. He would have been killed, but the man leapt from his horse and stabbed the boar repeatedly. As the years passed by, the Lord succumbed to old age. Still the man sat by his side. “I bless the bear that brought us together, my old friend. But I can not help but wonder why you have stayed. Your debt has been paid many times over,” the Lord said weakly. “My lord,” the man choked on his words, then continued “You saved me from the bear, then healed me. I had no home, no family, and no hope. You have given me all three. How could I ever repay that? Know that I will protect your with my last breath.” The Lord passed on knowing the man meant just what he had said. the Knowne World to compete in Equestrian Tournaments, teach, and Marshal. his home kingdom of An Tir.